Postcard Feat started out in 2007 as a practice website Yago Cura created for a microcomputers class in the Queen’s College Library and Information Science program. Since the architecture had to involve the design of web pages and images, Yago thought of Postcard Feat as a way to satisfy the parameters of his assignment, while creating an interesting visual project of personal, yet global, proportions. So, Yago enlisted the help of fellow poet, C.S. Carrier. 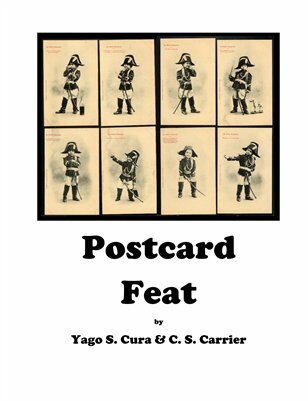 Over the course of two months in late 2007, Yago and Chris sent each other a postcard a week that contained one image plus one poem. This became their Feat, and they achieved it using Postcards of singular design. Through the efforts of the U.S. 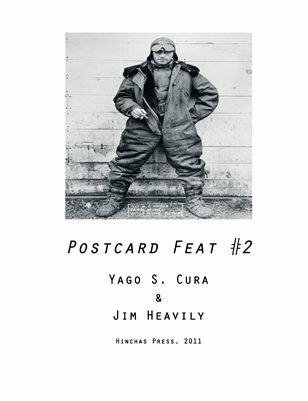 Postal Office, Yago and Chris were able to place myriad people in direct contact with their images and poems. The fact that they were doing this using one of our most venerated (and ailing) institutes, the U.S. Postal Service, is only testament to the importance of these communal hubs.